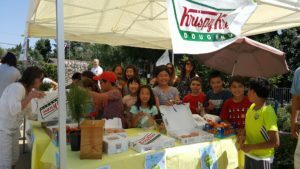 On April 20th, 2017 The Crescenta Commons kids from Monte Vista Elementary held a fundraiser. The Crescenta Commons Kids are a group of 3rd, 5th and 6th graders that signed up to help care for the tiny pocket park next to their school, Crescenta Commons. The fundraiser was a huge success. The kids sold Krispy Kreme donuts. They raised over $480.00. The funds raised will go toward new plants at the Commons. This was a great experience for them. They learned how to serve customers, count money, as well as how to be organized. Planting day is scheduled for May 20th at 8:00 am. The kids will come and learn how to plant and maintain the plants they worked so hard to raise money for over the past week. Like Crescenta Commons on Facebook: CrescentaCommons.